I’m probably the only beauty blogger in the entire blogosphere who has never written a post about her skincare routine. 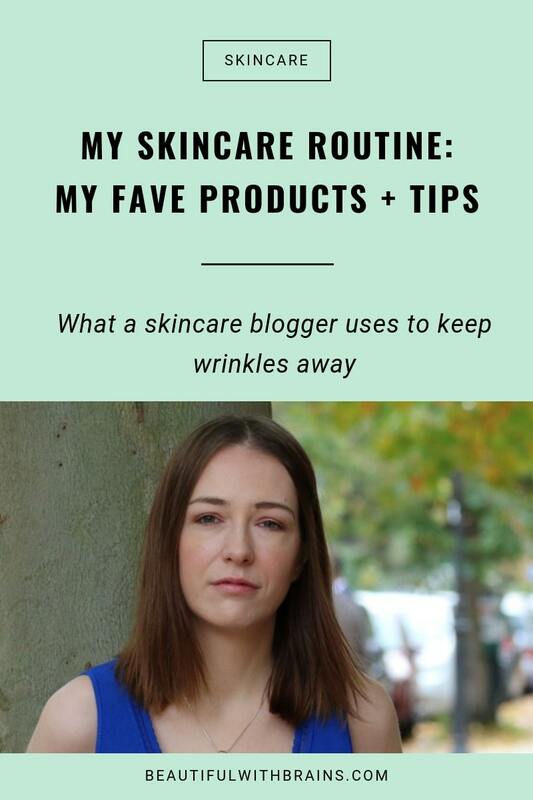 As a beauty blogger, I get to try lots of new skincare products all the time (who am I kidding, I was doing that even before I started blogging). Of course I have my favourites, those trusted staples I keep returning to again and again. And there are a few ingredients who are ALWAYS part of my skincare routine (retinol, anyone?). But the products do change. Every month, at least two or three new ones find their way into my skincare routine. I totally get it why you like reading them. Fighgting with your skin and wading through an endless sea of skincare products trying to find that magic bullet that’ll help you achieve the flawless complexion you crave is hard. We’ve all been there. So, when we find someone who has somehow managed to make sense of it all and created a skincare routine that actually works wonders, we want to know her secrets. It’s only natural. But, thing is, everyone’s skin is different. Even if you were to use all the same products I use and do everything I do, there’s no guarantee you’ll get the same results. A moisturizer my skin loves may be too rich for you and give you blackheads. Exfoliating at least three or four a week with glycolic acid works for me, but if you have sensitive skin, it’ll irritate it real bad. That’s why I prefer to tell you what tips and ingredients work and give you a bunch of products that contain those goodies to choose from. That way, you can find those that work best for YOU. But after the 1000th person asking me to share my skincare routine, I’m giving up. Yep, I’m finally sharing what I’m doing AT THE MOMENT. One thing to keep in mind before we start: I’m in my early 30s, my skin is combo (dry cheeks, oily t-zone) and my only concern is preventing wrinkles. I have no acne, dark spots, or breakouts to get rid of at the moment. Mine is a great routine for anyone, younger or older, who wants to prevent and treat the signs of premature aging. The ingredients that work against wrinkles are the same for all skin types and a lot of them double up as skin-lighteners too, so they can help you reduce any dark spots you may have. I’m not fussy when it comes to cleansers. As long as it’s cheap and gets the job done, I’ll use it. My absolute favourite is Liz Earle Hot Cloth Cleanser, which comes with washcloths to exfoliate skin while you cleanse. It’s so gentle, yet removes everything from the skin really quickly. If I’m wearing makeup, I like to double cleanse at night. Sometimes, I’ll use the oil cleansing method, and mix some castor oil with olive oil. If I’m lazy, I grab an oil cleanser. And then clean up the oily residue with a foaming cleanser. At the moment, I’m testing out L’Oreal Facial Cleansing Oil and Skinfood Rice Brightening Cleansing Foam (now both discontinued). FYI, don’t get hang up on the name of the products. Who cares if they’re not available anymore? Heck, if you had a different skin type/concerns from me, they probably wouldn’t have worked for you anyway. Focus on the routine order and practices (in this case, double cleansing). That’s what’ll make a difference. Glycolic acid will always be my first love. It exfoliates skin, hydrates it, and boosts the production of collagen – it’s the best for dry and sun-damaged skin. At the moment, I’m still loving Nimue Moisturiser Plus. But, other times, I’ll use my Foreo Luna Play or even a konjac sponge. It’s all the rage in Korea and it’s very gentle on the skin. I alternate between these 3 but I never use them together. And I never exfoliate more than 4 times a week. For my combo skin, that’s enough. In case you’re wondering, glycolic acid is the one I use the most out of the three. I believe chemical exfoliation is more even and gentler than physical exfoliation. But I’m fickle and I like variety so I’ll use those other gadgets every now and then. I don’t use a toner. There, I said that too. I don’t think you need one. You need to get your dose of all the goodies your skin needs to stay healthy and young, but they don’t have to come in a toner. They can come in a moisturizer. Or, better yet, a serum (I’ll tell you in a minute why that’s better). To me, toners are just an extra step I can gladly do without (lazy bummer here!). Yes, sometimes, I’ll use one. For example, I really like Nimue Conditioner Lite because it has a generous dose of vitamin C and that’s something that skin badly needs. But, at the moment, I’m not using any toners at all. And no, my skin doesn’t miss it at all. Related: Is Toner Really Necessary? Serums are a must. Period. They contain higher concentrations of active ingredients and a lot less unnecessary stuff, like emulsifier and thickeners, so they work better and faster than moisturizers and other skincare products. As I’m 33 and my only concern is to prevent wrinkles from appearing on my face too soon, I stick to antioxidant serums. The more antioxidant they contain, the merrier. My favourite combo is vitamin C + vitamin E + ferulic acid. It can boost sun protection so I always use it in the morning under my sunscreen. By the way, this combo also fights free radicals, boosts the production of collagen, and can reduce dark spots too. At the moment, I’m getting my fix from an old and trusted (and super pricey) favourite, Skinceuticals CE Ferulic. A cheaper alternative I also use often and that does pretty much the same thing is Paula’s Choice Resist C15 Super Booster. In winter, or whenever my skin is dehydrated, I’ll also throw in a hyaluronic acid serum, such as Bakel Deep Hydration Serum. Hyaluronic acid can bind to the skin up to 1000 times its weight in water. So hydrating! In case you’re wondering, I always use my antioxidants serums BEFORE hyaluronic acid. Or better, sometimes, I do. If a friend buys me a skincare set with an eye cream or a PR sends me one to review, I’ll bother. If not, I’ll gladly do without. Here’s the truth: eye creams don’t contain any special ingredients. They’re just facial moisturisers in small jars – but cost twice as much! Sure, brands will tell you they have special ingredients for your dark circles and puffy eyes. But have you ever found one that REALLY works? Exactly. I’ll keep using my facial moisturizers on my eye area. They work a charm. Related: Do You Really Need An Eye Cream? I’m a huge fan of the Olay Total Effects line. It’s one of the few that has niacinamide, an anti-aging superstar that treats dehydration, wrinkles, sallowness, dark spots, acne, and irritations. It does it all and without irritating skin! In the morning, I use the Total Effects moisturizer. At night, I use a retinol cream. Retinol is another skincare hero: it accelerates cellular turnover and boosts the production of collagen, which help reduce wrinkles. At the moment, I get retinol from Skinceuticals Retinol 0.5. This is advanced stuff, so if you’ve never used retinol before, skip this and get yourself something with a smaller dose. Also, at the beginning, don’t use it just after glycolic acid or vitamin C. All these ingredients are very powerful and may irritate skin, so it’s best to use them on alternate days when you’re just getting started. By the way, if I’m testing a new night-time moisturizer, I’ll get my retinol from a serum. One of my favourites is Paula’s Choice Resist Intensive Wrinkle-Repair Retinol Serum. Retinol is not optional, if you’re serious about anti-aging (unless you have sensitive skin that can’t tolerate it at all). Related: What’s Strength Of Retinol Should You Use? I swear by Sunumbra sunscreens. They’re mineral (all zinc oxide based), full of antioxidants, and have no filler ingredients, such as thickeners. Sunumbra Sunkids 40 is my fave because it’s tinted (no white cast, yay! ), but I’ve just run out of it so I’m using Sport SPF 40 (not tinted) at the moment. Zinc oxide sunscreens may be thicker and, sometimes, leave a white cast behind. But, they provide broad-spectrum protection without causing irritations, or worse. Even sensitive skin can use them! I don’t need to say that I use sunscreen religiously every day, right? To hydrate: I like to use a sheet mask once or twice a week to give my skin some extra hydration and radiance. I don’t have a favourite, though. I like to try new ones all the time. I’m fickle like that. To moisturize and soothe: most nights, especially when my skin feels a bit dry, I’ll also use a facial oil. At the moment, I’m in love with Beuti Beauty Sleep Elixir, because it’s very moisturizing and soothing. It can fight inflammation, which is one of the main causes of premature wrinkles. To absorb excess oil: my skin has been behaving recently, so I haven’t used a clay mask in a while. But, whenever my t-zone starts to get oilier than usual, I’ll cover my face in Elizavecca Carbonated Clay Bubble Mask. It does what every other clay mask does, but the carbonated water reacts with oxygen in the air to form tiny bubbles on the skin that turn your face into a cloud. So cool! There you go, my skincare routine. I hope this is useful. Let me know if you have any questions. Now, it’s your turn! What’s your skincare routine like? Share your routines in the comments below. Can The Yoso Pro Boost The Effectiveness Of Your Skincare Routine? -Cleansing: Unless I’m short of time or feel down the weather/too tired I always use a hot cloth no matter if it’s in the morning or in the evening. For cleansing I use Neutrogena Extra Gentle cleanser and to remove makeup Avon Anew Cream Cleanser or The Body Shop cleansing balm depending of the amount of makeup I wore. -Treatment: I still don’t use a serum due to the price, but I always try to have a bottle of Olay Total Effects cream and use it in the mornings. For retinol I’m using Palmer’s face oil which includes retinol and vitamin C (if you can watch the ingredients I’d love to hear your opinion) and for exfoliation as I use a cloth twice a day I only use Derma E Overnight Peel two or three times per week both at night. -Sunscreen: I’m using a Nivea one which is a mix of Titanium Dioxide and chemical filters, I haven’t bite the bullet with Sunumbra due to shipping (also their ads with information of EWG make me sick) and I haven’t tried any zinc oxide based sunscreen as I don’t know which one is best while looking at iHerb. Also for reapplying over makeup I use a face spray by La Roche Posay. Gio as a recommendation: why you don’t put the search bar of your blog up in the right? I always have trouble looking for it. Also every answer to my comments goes to spam. Efrain, love your routine! For serums, have you tried Skin Actives? Their prices are very reasonable. The Palmer’s face oil is good. Very moisturizing. Doubt the vitamin C will do anything as there’s so little of it in there. But retinol works even in tiny doses so for that it’s good. Thanks for your suggestions. I’m thinking of changing layout again soon and I will take the position of the sidebar into consideration when I buy the new theme. Re the spam, oh no! Not sure what to do about it. Have you tried adding the email address in gmail? That should tell it it’s not spam. So sorry you’re having this problem! Morning. Cleaning with a mild cleaner like La Roche Posay Toleriane or CeraVe hydrating cleaner. Rinse of with plenty of water. Then I follow with PC super antioxidant serum. Every other day I add a drop or two of Timeless Vitamin c 20% to the PC serum to boost the vitamin C, or I will vit C with som Indeed labaratories hyalauronic serum. Moisturizer and on top make up Emergin C broad spectrum tinted sunscrean. Dobbel cleaning with eiher avocado oil or wheat germ oil and Glytone mild cream clenaser. I use a warm washcloth to wipe of the oil and then follow with the cleansing cream to remove all oil residue. Or some nights a cream cleanser (toleriane) followed with PCs make up remover. I use prescription tretinoin cream mixed with a little moisturizer every night except two nights a week where i will use PC 10% weekly exfoliator, followed by moisturizer or a moisturizing mask. Sometimes if my skin feel dry I will add a few drops of oil (avocado/rose hip) to the moisturizer. So,thats it. What do you think? Should I add something or remove something? Is it okei to add the Timless vit C serum to the PC serum? Or with the hyalauronic serum? Is it ok to mix the tretinoin cream with some moisturizer? I feel that this helps a lot with dryness and flakyness that I sometimes experience when using tretinoin cream. Suzanne, I like your skincare routine. It’s quite simple but you’re using all the right ingredients. If this routine is working well for your skin, I wouldn’t remove or add anything. But I’m concerned about you mixing products. I know that mixing tretinoin with moisturizer makes application easier but you’re also diluting the formula and its effectiveness. If you can, try using every product separately to maximise the results. My parents educated me from childhood about skin care: moisturise + apply sunscreen religiously; always wash your face in the evening, even tired; changing pillowcases/ towels regularly and so on. I’m so grateful for that! My routine fluctuates following the season, my skin needs, my fancies etc. I share pretty much the same basics as yours otherwise: HA, anti-oxydants, seasonal powerhouse treatments. My main concern being dilated pores on combi skin and some upper cheek brownish marks, despite my religious use of sunscreen. I will take the plunge into retinol world this fall! Both AM and PM, I massage my face with no pressure. I make the most of the slippery feel to treat myself with a quick acupuncture techniques for lymphatic drainage. I also make sure to rinse very very well. I’m testing for a few weeks a Russian black soap which happens to be a very gentle oil paste, akin to Middle-East black soap. I love using my konjac sponge for that purpose and it leaves my skin radiant and not squeaky to the least. Some spritzes of Nutrimetics beetroot and taro mist + Uriage water before patting my face dry with a soft towel. 3. First Time Essence: I love the glow fermented essences give to my face, be it saccharomyces, flowers or grains. I make sure to almost drench my skin with it, sometimes with 2 drops of Hada Labo Gokyun HA. Then, I pat it down gently with my hands. I just make sure they do not overlap with the rest of my routine. I apply it while my skin is still a wee bit damp from FTE. 5. Moisturiser: for summer, I favour a nice moisturising milk or a light gel cream. I’ll test Ilsci sour cherry gel cos my Hada Labo Arbutin milk is almost finished. 6. Sunscreen: always 50+ PA+++ all year long. I prefer physical sunscreen but I also like alternating with Japanese chemical filter ones. 1. Makeup and/ or sunscreen removal: Note the word ‘removal’! To me, the ‘double-cleansing’ terminology is incorrect because taking off stuff that can be dissolved in oil only is not making your face technically clean at all!!! I’ve been home blending some organic oils that work wonder in removing even waterproof eye makeup: avocado, coconut, hemp, black nigella… the latter ingredient giving my skin a satiny, baby-like quality. Even its pungent scent – think fenugreek seeds- grew on me. For winter, I prefer a comforting blanket balm. I use Demak’up small cotton pads (the ones that are woven like beehives) for my eyes and lips. I then wipe my face and neck with a giant cotton pad that usually serve for babies. COSRX salicylic one + tea tree wash, using a soft-as-a-kitten-fur-balls Korean brush for a cushioning bubble party! Perhaps I will try their 5.5pH wash next time I feel the need for tea tree oil next summer. For fall, I’m to test Cor soap soon to see what it’s all about. I often use some bamboo or silk cloth to help wiping it off. 4. Essence: what Asian market sells as ‘whitening’ but it’s just a traditional niacinamide/ arbutin etc. rich stuff. 5. Serum: antiaging again! I like to use something different from AM, again, just for fun. I happen to love variety! 1. COSRX BHA (PM): using a Korean or Japanese small pads, those are meant to apply products and do not absorb them, contrary to their European counterparts. The night after BHA treatment, I use Clarisonic to try coaxing out the gunk – that’s the only time of the week I’m using that device. 2. Alpha Hydrox Glycolic 10% AHA: a giant 177ml bottle (yeah, I know!) for less than 18€ and it works sooo well! My face looks absolutely clear, neat and yuri pibu, as they say in Korea, water-limpid. I leave it overnight and I don’t use anything else before and after. It’s so emollient, yet penetrates quickly. 5. Sheet masks: once a week, just for that dewy sheen only a super hydrated skin can give off. I strongly recommend the ugly silicon overlay to help sheet mask adhere to skin better, you know the one with the ear loops. So practical when you’re a fidgety person! 6. Sleeping masks: to me, quite interchangeable with good old, SPF-free moisturiser! 7. Oil: Pai Rosehip oil is spot-on for glowing skin! I love to use it at night, 2 drops mixed with honey sleeping mask at the very end of my routine to seal the deal. It’s so economical I can afford to use a mixture of it with HA and rich cream on my hands too. 8. After facial hairs plucking: no active or acids here. Just FTE, a plain tomato or cucumber water-based Korean gel, followed by an oat-based cream. 9. Suqqu acupuncture pressure points and face rollers: very relaxing indeed, after my oil+sleeping mask combo! The consistency of the latter being emollient, that’s the best bi-weekly, real deal match. I just don’t do it after acids. Skincare is such a pleasure, never a chore and this is a me-moment that is all about respecting ourselves. It was a long comment indeed but so helpful and well thought out. I love your skincare routine, you’re giving your skin all the essentials plus some nice extras that go the extra mile. I agree with you. So many people rush through their skincare routine and it’s a shame. It should be a relaxing moment when you’re pampering and taking care of yourself. And that’s so relaxing for the mind too. – Laneige lips sleeping pack: I first thought that stuff may be a gimmick and was a bit taken aback by the wax-to-oil consistency and the berry yogurt faint smell. But what came as a nice surprise is its high efficiency in sealing Dexeryl moisturiser (logic! ), erasing discolourations overnight, and keeping my lips rose pink, smooth and juicy. A teeny tiny amount suffices, so the jar will last me forever. Oh, I love the Laneige lip sleeping mask too. I use it as lip balm and works wonders for that. I even like the scent. lol. Oh God, compared to everyone I think my skincare routine is so simple it can be considered as a lazy skincare guide for sensitive skin. Sometimes after using all this I would spray again with Avene Thermal Spring Water Spray. This spray is such a life-saver for sensitive skin. My kind of ride-or-die skincare product! Audrey, I think your skincare routine is pretty good. I only use 4 products at night and 4/5 in the evening too. It’s not about how many products you use, it’s about what ingredients you are feeding your skin. A few carefully chosen actives do a lot more than plenty of average products. Glad to know I’m not the only one who doesn’t use 10-step skincare in the morning and night. All this time I feel like I’m the laziest when compared to my friends. And they still haven’t got around my weird habit of not using tap water anymore for my face 🙂 Replacing tap water with micellar water is the best thing I’ve ever done to my skin, after using sunscreen. Ellanie, you can use Superoxide Dismutase either morning or evening after cleansing. MMHA morning and/or evening before moisturiser. And. mix Photography Fluid with your foundation. Morning: Up until a few days ago I washed with the same cleanser I use at night (PCA Facial Wash – recommended by my aesthetician), but my research showed that washing in the morning was not necessary since I already cleansed at night. So I just wash with water now, although I’m considering using my DIY apple cider vinegar and water toner in the morning to wipe off any residue that might build up from my pillowcases or from sweating at night. Then follow up with my moisturizer with SPF. Night: Wash off makeup with PCA Facial Wash and apply retinol serum. That’s it, and I wonder if that’s enough or if I should be adding more moisture? Any recos? Extras: I exfoliate with my Micheal Todd brush 2x a week. I use 2 different masks once a week (on different days): Lush Mask of Magnaminty (penetrates pores and tightens skin for a nice glow) and Shea Moisture Clarifying Mud Mask, which is more moisturizing. What sheet mask do you recommend for more moisture? I feel that between the exfoliating, the retinol and the hard water, my skin is begging for hydration! Laura, I do like to cleanse my face in the mornings but I use a gentler cleanser as there’s not much to remove. I’d be wary of apple cider vinegar though as its ph is too harsh for the skin and could dry it out. I am a big believer that less is more when it comes to skincare. If your skin needs more moisture, it’ll let you know! If you feel your skin needs more moisture, I’d add a hyaluronic acid serum and a lightweight moisturizer. Pick one with niacinamide because it soothes skin and treats wrinkles too. Hi Gio, a quick question on the Olay Total Effects moisturizer – I’m not sure what formulation you use, but here in the UK, Isopropyl Palmitate is 6th on the ingredients list, and I know in another post you mentioned that ingredient can be comedogenic – do you have any problems with that? Thanks. Porcelina, I usually avoid it when I see it in 6th place. In Italy, it wasn’t there at all but since I’ve moved to London, I haven’t used it. If your skin’s dry and not prone to breakouts, I don’t think you will have any problems with it. My skin is combo and it gives me pimples only on my oilier t-zone. I have normal to dry skin, but I get clogged pores in my t-zone if I forget to use my BHA products for too long. My skin is thin and can get red easily but I haven’t experienced any allergic reactions or sensitivities lately. Please let me know what you think about mine since I’m really sure if I’m doing it correctly. 1. Clean my face with water and cotton pad. 5. Shiseido Ultimate Sun Protection SPF 50 Sunscreen + WetForce for Sensitive Skin & Children ( a sunscreen with 9.1% Titanium Dioxide and 19.3% Zinc Oxide). I live in southern California and the UV rays here are very strong. I’m currently looking for a chemical sunscreen to be applied before my physical sunscreen (Shiseido Ultimate Sun Protection SPF 50 Sunscreen + WetForce for Sensitive Skin & Children) to better protect my skin from UV damage. I am aware that the zinc oxide and titanium dioxide in my physical sunscreen can degrade the popular chemical sunscreen ingredient, avobenzone, and hence cannot be used together. Do you have any recommendations? Please let me know what you think about my routine since I’m really NOT sure if I’m doing it correctly. Diana, I think your skincare is perfect! But am confused about why you need two sunscreens? SPF isn’t cumulative. If you use a sunscreen with SPF 30 and one with SPF50, you only get SPF50. Thank you for your prompt response! I understand that SPF isn’t cumulative, but I read that layering a chemical sunscreen under a physical one offers more UV protection. The theory is that “physical sunscreens prevent UV light from hitting the skin, whereas chemical sunscreens take UV light that makes it through and transforms it into non-damaging forms of energy, like non-UV light or heat”. What do you think of this? I have yet to be able to find a study that can confirm this theory. Gio, I would love your opinion on my skincare routine. I am 23, acne-prone, oily-combination in winter and oily in summer. My routine is failing me at the moment because I am too shiny in the daytime due to my moisturiser, yet too dry if I don’t use it, as it’s winter. My acne isn’t dramatic but it’s consistently ~5 large, raised red spots in the same general area on my cheeks. I also have large pores but from my research it seems like this issue can’t be permanently rectified (?). 1. Use the benzoyl peroxide spot treatment BEFORE moisturizer. A rich moisturizer can create a barrier that makes it difficult for BF to reach the skin and do its job properly. 2. Switch to an oil-free moisturizer. It’ll hydrate your skin well but has a more lightweight texture. Ashton, yes I do. Some eye creams go the extra mile and use ingredients that may help with certain types of dark circles but the vast majority of them isn’t that different from facial moisturiser. Find a fragrance-free one that works for you and use it all over. Ok, this post is a life saver. I am only 19 but due to poor eating habits and not hydrating, I already have signs of aging and fine lines. Here’s to hoping I can fix myself!!!! Eye cream is very importante, the skin around your eyes is different, is skinier and is way more sensitive, só if you use your face cream in your eyes is pretty much the same as using body lotion in your face, is just not the same thing. The toning lotion is also important because it helps balancing the pH of the skin. Sofia, yes the skin around your eyes is thinner but the ingredients that moisturise skin/fight wrinkles /whatever are the same for the face and eye. So it’s about finding a facial moisturiser that’s thin enough for the eye area. 1) after using retinol, is my skin still consider oily skin? Should I still use AHA or switch it to BHA as my exfoliant? 2) For the AM routine the moisturizer you use is Olay with niacinamide in it, but I read and heard that Vit C will not work well with Niacinamide, and your serum has vitamin c in it.. will it be ok ? How do you put it, do you apply the moisturizer after some time applying the serum? 3) Can I still apply a moisturizer with niacinamide eventhough I am using an cream with hyaluronic acid for my acne solution? 1) For the PM routine, do you use also the antioxidant serum before the retinol cream? 2) For the nights I am not using retinol cream, can I used a serum also, like Niaminacide and Hyaluronic Acid, since there are really some PIH that I want to lighten and at the same time I want to boost up my skin hydration? Or would it be too much for my skin since I am planning to use antioxidant serum in the morning? Sorry for so much questions! Hope you can enlighten me, plssss. Thanks again for all the wonderful articles you share with us! I also saw in your shop that azelaic acid is one of the best ingredient / product for hyperpigmentation. Can you tell me how to incorporate this also on the routine? It is so confusing to pick what products should be your priority if many deals with what you are experiencing.. Please enlighten me.. Thank you once again Gio!! Your blog is my everyday read and guide!! Im so happy i found you!